In September 2016, the Guerin Family Institute for Advanced Sciences at Milken was officially opened after undergoing an incredible $6.2 million renovation. The cutting-edge science facility's makeover was part of Milken's ongoing commitment to advancing STEM (science, technology, engineering, and math) education, promoting innovative technologies, and positioning Milken as a world-class educational institution. The Guerin Institute, located on the Upper School campus, houses the area's only MIT-Inspired Fab Lab, joining a global network of Fab Labs. The comprehensively advanced science facility also houses a CAD Lab, engineering lab, and an international classroom designed to connect students with a global community of professional and educational resources. Equipped with 3D printers, laser cutters, a milling machine, and programming tools, The Guerin Institute has been a welcome hub on campus encouraging hands-on student exploration, imagination, and invention. Students are encouraged and inspired to become innovators and entrepreneurs, with several who even own and operate their own successful businesses. They even compete nationally and internationally in notable science contests, often winning prestigious awards and recognition. The design of the facility includes glass walls and open spaces invite people to observe, collaborate and innovate at the highest level of detail. A centerpiece on campus, The Guerin is also an attractive meeting space, which accommodates classes and special events, and students and faculty from all disciplines have utilized the tools, technology, and training available. The sky is the limit when it comes to what you can create in this digital workshop. Download the FREE Innovator's Notebook! 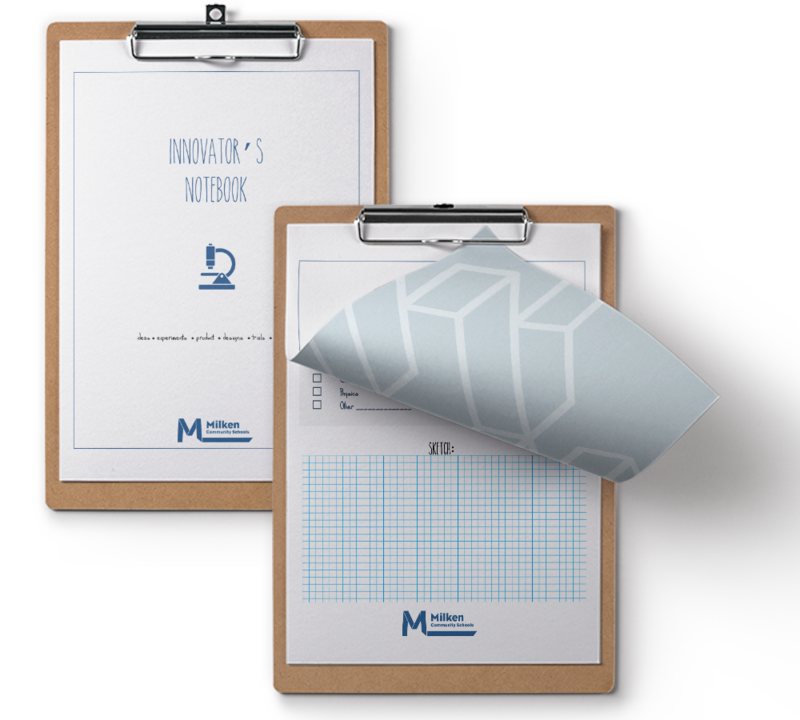 Perfect for aspiring scientists, entrepreneurs, inventors, and coders, Milken’s Innovator’s Notebook provides a framework for iterating experiments. Click here to download for free!